Image caption Verrit describes itself as "media for the 65.8 million"
It's a website that describes itself as "media for the 65.8 million" - a reference to the number of Americans who voted for Hillary Clinton in the 2016 US presidential election. That's a sizeable number, and if anywhere near that many had signed up, Verrit would be a very successful outlet. Instead, it has collected relatively few followers, and has highlighted divisions in the Democratic Party. 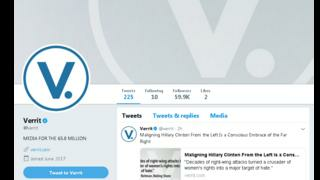 Set up in June 2017, and endorsed earlier this month on Twitter by Clinton herself, Verrit is a website whose primary function, according to its creator and former Clinton adviser Peter Daou, is "to bring together like-minded people." "My wife and I are quite active on social media, and the community we are most involved with are Hillary supporters and voters and people who share their mindset," Daou tells BBC Trending. "Since the election one of the main refrains we would hear is that these voters feel intimidated and harassed when they go on social media and they also feel invisible in the mainstream media," he says. "So we thought it would be great to create a space where they could converse with each other, where their issues would be centred and highlighted." The site displays a number of virtual message cards - known as "Verrits" - that quote a headline or short phrase. By clicking on the headline the reader is greeted either by a piece of text or links to news articles. Examples of some recent headlines the site has hosted include "Murder is a leading cause of death for pregnant women in the United States." When clicked on, the headline leads to a Washington Post article from July. Another reads: "By 2050, water shortages will affect a quarter of the world's population." But on the site, statements of fact backed up by legitimate news outlets freely mix with opinion and spin. Other headlines include "'Hillary Democrats' are the heart and conscience of America" and "The Republican Party is harmful to America's children." It was quickly criticised by some of Clinton's most determined opponents on the right. While that might not have been surprising, criticism of Verrit has also found root amongst those on the left. Overall online, the negative reaction was overwhelming. Politico described Verrit as "a propaganda rag so shameless it would make Kim Jong Un blush." Gab: Free speech haven or alt-right safe space? Brendan James, one of the co-hosts of the leftist political comedy podcast Chapo Trap House is no fan of Clinton. But he also says he isn't convinced by the concept behind the site. "It's not really a social media site because you can't upload anything to the site, you can't post your own material and these aren't really facts he's disseminating," he tells BBC Trending radio. "I dare say even the more rabid Hillary voters don't quite know what to do with [Verrits]. "I suppose you could pass them round like a meme, or use them in a little argument you might get in an email chain with your aunt," he says. Although Clinton's tweet received more than 22,000 likes, Verrit has not gone hugely viral. Its Twitter account has only about 60,000 followers, and its Facebook page has about 12,000. Daou says he doesn't take the criticism personally, and argues that the reaction shows he must be doing something right - and that his critics are scared of Hillary Clinton and Verrit. "If her voice is being reflected in Verrit then she is here to stay," he says. "I think long term, the idea of Verrit being here to stay does frighten people who don't want that view to be expressed." Unsurprisingly, Brendan James from Chapo Trap House takes quite a different line: "Well, that's sort of the only thing you can say when you've failed miserably in doing what you set out to do... if it were true that all of these people who voted for Hillary were as adoring of her as Peter is, this venture would make sense and they would all be clamouring for this service. "Unfortunately I think the number of people who are really dying for this number in their dozens not their millions," he says. The incident highlights a key split in the Democratic Party - which is made up of many factions, but broadly speaking can be divided into Clinton loyalists, and supporters of the socialist Bernie Sanders, who challenged Clinton in the Democratic presidential primary. Online, Clinton supporters use hashtags such as #StillWithHer - a reference to Clinton's popular "I'm with her" slogan - and #TheResistance. Sanders supporters are more likely to tweet #FeeltheBern - and as the debate over Verrit shows, these two factions have not quite been united in their shared opposition to President Donald Trump. You can follow BBC Trending on Twitter @BBCtrending, and find us on Facebook. All our stories are at bbc.com/trending.